This recipe was contributed courtesy of Donna Fontaine, of Primal Recipe Tester. If you are not strict Paleo, you may enjoy a little high quality dairy once in awhile, which is considered perfectly fine if your body tolerates it well. 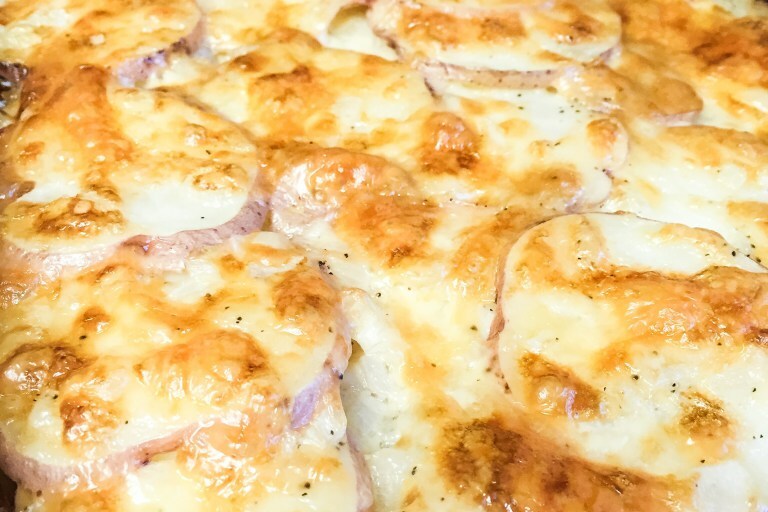 If that’s the case, this recipe for Au Gratin Potatoes will be right up your alley! While this is not a strict Paleo recipe, it can be considered Primal because it does use real food ingredients, like organic potatoes and raw, grass-fed cheese. This is a wonderful side dish for holidays like Thanksgiving, will be be sure to impress and delight your guests! Preheat oven to 400 °F and lightly grease a 9 x 13 baking dish with bacon fat. Heat the avocado oil in a small sauce pan over medium heat then sauté onion for 4 minutes. Add garlic then sauté for 1 more minute. Add coconut milk and spices to the pan and stir to combine. Turn off heat. Layer half of the potatoes in the baking dish, then half of the cheese and top with the rest of the potatoes. Pour the coconut milk mixture over the potatoes then spread the rest of the cheese on top. Bake uncovered for 45 minutes. If you see the cheese getting too dark lay a piece of aluminum foil over the top. Let cool for 10 minutes before sprinkling with bacon and digging in. Donna has always loved cooking, trying new recipes and living a healthy lifestyle, so after learning about the Paleo Diet from a close friend in early 2015, she knew she wanted to give it a try. She feels the happiest, healthiest and most confident that she has ever had in her life and Donna is convinced that it’s from living a primal lifestyle. Donna loves not only what she is doing for herself but also what she is doing for her family. 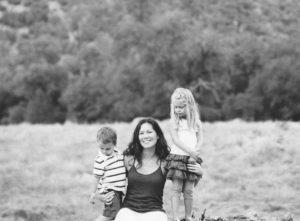 Donna and her husband have a six year old daughter and a five year old son, and live in the beautiful Sierra Nevada Foothills in Northern California where she works and try to spend as much time as she can with her family being active outdoors, exploring and traveling. Eating a Paleo breakfast can sometimes be a challenge, especially with little ones who are picky. 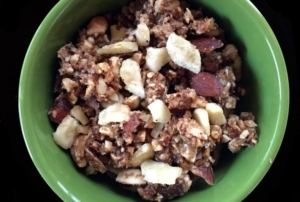 This recipe for Maple Walnut Banana Nutola is reminiscent of a traditional banana nut granola. Your kids will love munching on this for breakfast by itself, or with almond milk as a replacement cereal. It’s also good for snacking on the go! Preheat oven to 300 °F. Pulse nuts in a food processor until you get your desired size. 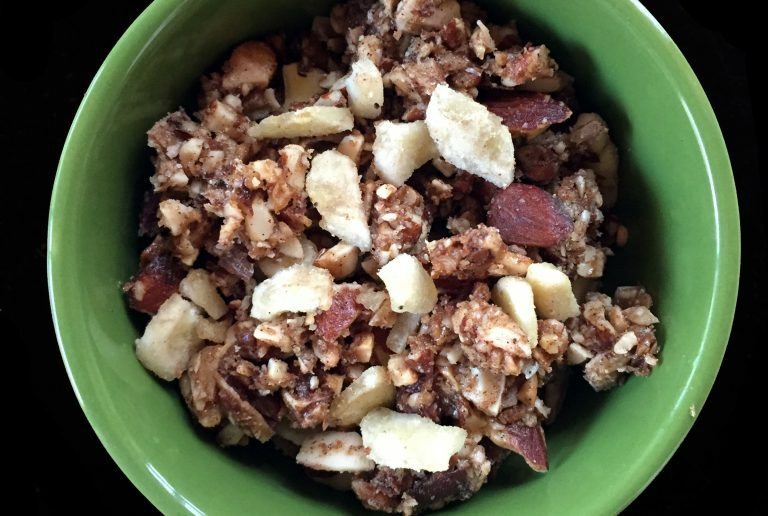 Combine all of the ingredients, except banana chips, in a large bowl and mix well. Spread in an even, single layer on a large, lightly oiled baking sheet and bake for 25-30 minutes. Let cool before mixing in banana chips then transfer to airtight container. Fall is a favorite season for the flavors of apple and cinnamon, and if you are a fan of the two, this recipe for Apple Cinnamon Nutola will be music to your mouth. It is grain free and Paleo-friendly, as it is full of real food ingredients like honey, and the aroma of it baking in the oven will leave your house smelling lovely. Combine all of the ingredients, except dried apples, in a large bowl and mix well. Let cool before mixing in dried apples then transfer to airtight container. This article was contributed by Donna Fountaine of Primal Recipe Tester, in honor of Testicular Awareness Month. Remember that what goes on his body is just as important as what goes in it! 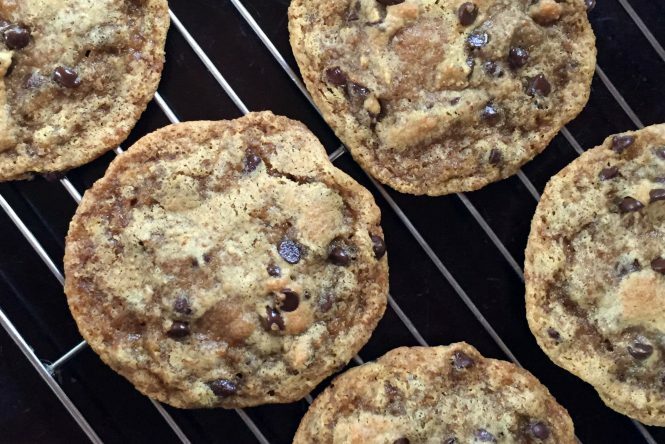 This Paleo Chocolate Chip Cookie recipe makes you forget all about the bakery. 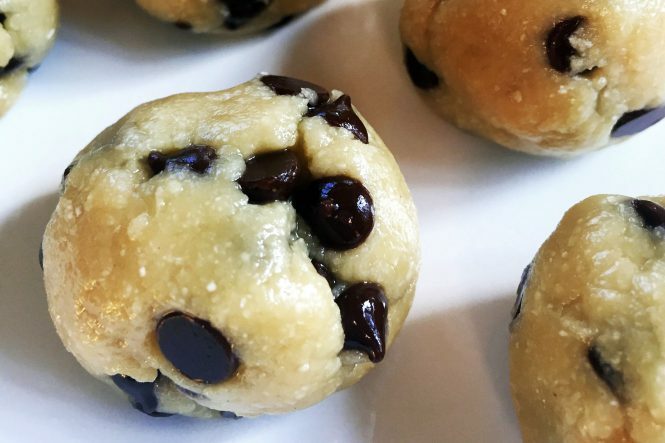 These Primal cookies are crispy on the outside, ooey gooey on the inside, have a hint of butter and are grain free, nut free, and refined-sugar free. You could even make these dairy-free by omitting the clarified butter and using all coconut oil. There is quite a bit of coconut sugar in these, but they are still a much healthier alternative to regular cookies! Combine the coconut palm sugar, melted clarified butter and melted coconut oil in a large bowl and mix with a hand blender on medium speed for 2 minutes. Add the egg and vanilla and blend for 1 minute. Add the rest of the ingredients except the chocolate chips and blend by hand and then on low until combined. Preheat oven to 350 °F with rack in the center. Drop the dough by rounded tablespoons 2 inches apart onto ungreased cookie sheets. ** Bake for 8-10 minutes or until edges turn golden brown. Let cookies cool for 5 minutes then transfer to a wire rack to cool for another 10, if you can wait that long. *If you do let the dough rest in the refrigerator for 24 hours, you'll want to increase the bake time by 1-2 minutes. **To get cookies with an uneven top, roll dough into a ball, gently tear the ball in half then smoosh dough back together with torn sides up. Eureka! 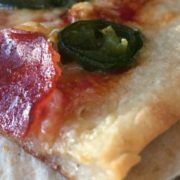 I have created a Thin Crust Pizza Dough that tastes just like the real deal with no almond four, eggs, coconut flavor or cauliflower. There’s no pre-baking and the crust turns out crispy on the outside and chewy on the inside. 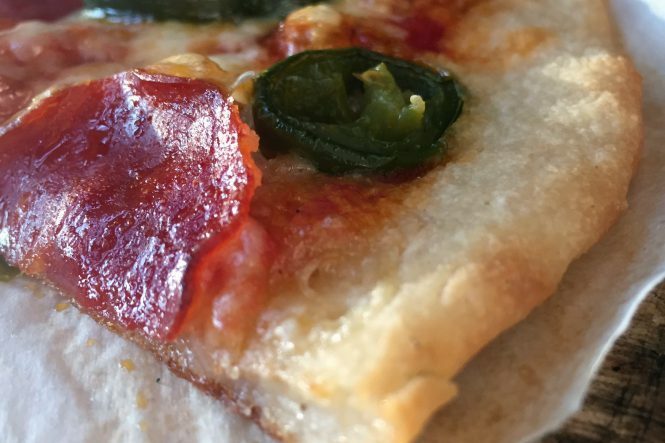 This is a simple grain-free pizza dough that’s easy to make and tastes delish. Combine all of the dry ingredients in a large bowl and mix well then add the olive oil, honey and warm water and mix until dough forms. Form the dough into a ball and lightly coat with the extra olive oil. Place the dough ball back in the bowl, drape the bowl with a towel and let sit in a warm place for 1 hour. After 1 hour, preheat the oven with a pizza stone to 550 °F. Spread the dough about ¼ inch thick on parchment paper and add desired toppings. Trim excess parchment paper, then use a pizza peel to transfer the pizza onto the pizza stone. Bake for 10 minutes or until crust is golden brown. Broil on high for 1-2 minutes to brown the toppings if desired. Hi I’m Donna! I have always loved cooking, trying new recipes and living a healthy lifestyle, so after learning about the Paleo Diet from a close friend in early 2015, I knew I wanted to give it a try. I feel the happiest, healthiest and most confident that I ever have in my life and I’m convinced that it’s from living a primal lifestyle. I love not only what I’m doing for myself but also what I’m doing for my family. My husband and I have a six year old daughter and a five year old son, and although they don’t always love being Primal, I hope they’ll thank me someday. I live in the beautiful Sierra Nevada Foothills in Northern California where I work and try to spend as much time as I can with my family being active outdoors, exploring and traveling. 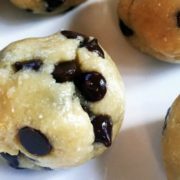 These nut butter chocolate chip cookie dough balls are reminiscent of peanut butter chocolate chip cookie dough. These cookies are Raw, Paleo, and healthy all around with ingredients like coconut oil, nut butter, and raw honey. The best part is these cookies are super easy and quick to make! Your kids will absolutely gobble them up in a flash, so our advice is to make a double batch! (And possibly hide half for yourself!) You can also feel free to substitute the sunflower seed butter for cashew butte or another nut butter of your choice. Combine all of the ingredients except the chocolate chips in a medium bowl and mix well. 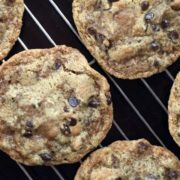 Fold in the chocolate chips, have a taste, then place the bowl in the refrigerator for 30 minutes. Remove the bowl and roll the cookie dough into desired sized balls. Store in an airtight container in the refrigerator, and try not to eat them all at once! This post was contributed by Donna Fountaine of First 5 Faves. Halloween face paints can be pretty scary, and so can some of the ingredients that are in them. Several years ago The Campaign for Safe Cosmetics found lead and other toxic heavy metals like nickel, cobalt and chromium in several of the most popular face paints on the market. Some of these face paints were labeled as “non-toxic “ and “hypoallergenic” but contained the highest levels of some of these heavy metals. “Natural” face paints may seem like a safer option, but most of the natural face paints available contain synthetic preservatives. When shopping for face paints, try to find products without formaldehyde/formaldehyde releasers, fragrances, parabens, petroleum, phthalates, synthetic colors and synthetic preservatives because these ingredients can be irritating, toxic and/or carcinogenic. One great option is making face paints at home because they are quick and easy and can be made with just a few simple ingredients. Here is an all natural, DIY Halloween face paint recipe that you can be sure to feel good about knowing there are no nasty ingredients in them! A quick and easy natural DIY Halloween face paint recipe that kids will love and can be washed off quickly and easily with warm water and soap. Transfer to storage containers and use a soft brush to apply to face or body. 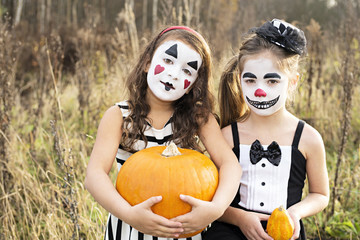 If making your own homemade face paint is too much work, another great option is buying one of the few brands that offer natural Halloween face paints that are free of lead, heavy metals, parabens, bismuth, carmine, and fragrances. 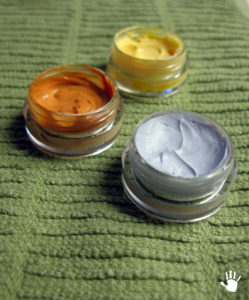 Le Petit Matisse is one brand that carries safer natural face paint options. 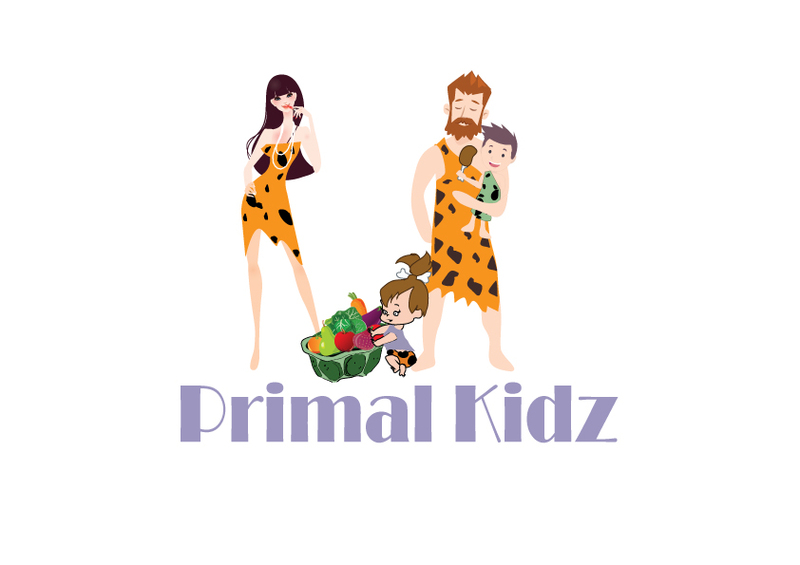 Another great brand is Elegant Minerals, which can be found in Primal Kidz Mag’s Shop section. 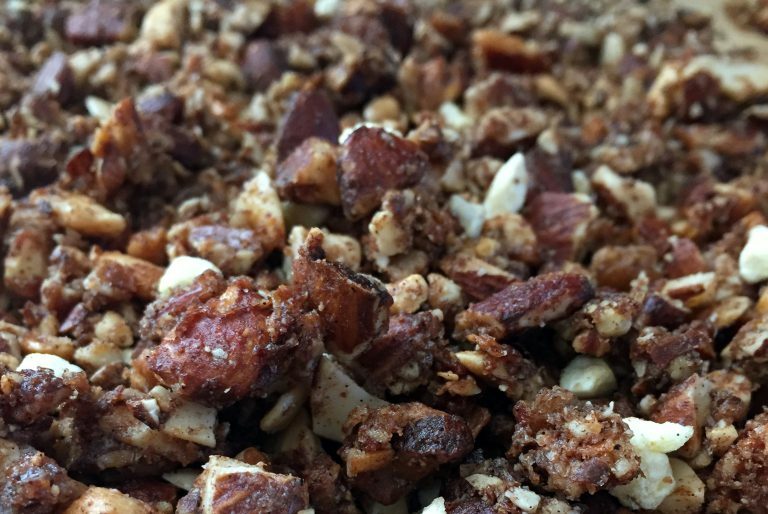 Donna Fountaine is a wife, a mom, and a Primal Recipe tester on her personal blog. She discovered the Paleo diet in early 2015, when she began researching ingredients and reading labels more closely. During the first few months of her family’s transition to a primal diet, Donna decided to read the ingredients in their personal care and household products because she wanted to be sure that what her family was using on their bodies and in their home was just as healthy as what they were eating. When she discovered synthetic preservatives, questionable ingredients, and known carcinogens in their “all natural,” “organic,” and “eco-friendly” products she vowed to always read the ingredients first. 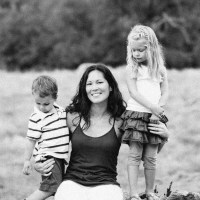 Donna then decided to start First 5 Faves to help educate families with young children about the importance of age appropriate, non-toxic and eco-friendly products. You can also find her testing Paleo recipes from her favorite Paleo bloggers at Primal Recipe Tester.